Ahh Mother’s Day. As a mom of three, I always look forward to it – and I will just admit it – I am more often than not slightly disappointed. Not because my husband or kids somehow fall short – far from it. They always go out of their way with hand-made cards, heartfelt gifts and fun plans for the day. Not because I somehow want to avoid celebrating my mom- who is fantastic and worthy of far more that I ever give her. I think I am always a bit disappointed because I have built it up as something it isn’t or can’t be. For some reason, I have it in the back of my head that Mother’s Day is going to be the perfect day. I’ll awake late in the morning, having slept in, to the soft sound of the birds chirping and the smell of a hot, perfectly creamy, cup of coffee. The kids won’t fight, we’ll be on time for church, then we’ll walk through the day on a cloud of peace and joy, stopping to picnic on a field of flowers and butterflies. And there will be a money tree blooming in the yard that I will harvest as I eat calorie free ice cream and chocolates. Until this Mother’s Day, mind you, I never realized this was what I was doing – I just knew I always had to work real hard not to get frustrated or let down on Mother’s Day. This Mother’s Day started with the baby waking early with a fever (cutting molars.) Then we found two dead baby bunnies in the walkway that our aptly named cat, Rascal, chased down and decided to leave us as some sort of offering. Patrick had to leave early to get to Sunday School and teach, the house was a hot mess, the kids were running late, Wil was fussing, and when the kids and I finally got off to church, my coffee was ice cold – and not on purpose. Over-tired and overly frustrated, I listened to the kids argue as I drove them to church. The nursery didn’t think Wil should be there if he was ‘sick’ – though last time I checked, cutting molars was not contagious – so I turned around and huffed out. (Overly dramatic and a bit embarrassingly, really.) I stomped up to Patrick’s class to tell him I had to take Wil home, and then I cried half-way there. Big ‘ol pitty party for me. Then it hit me – get over yourself! Your life, your job as a mom, is no more taxing than any other. Dare I say, far easier than many. My kids are healthy, we have decent roof over our heads, the kids all get along (for the most part), and when he isn’t cutting molars, Wil is an absolute dream baby. The unexpected blessing that makes life shine. Motherhood isn’t about a day off. It isn’t about breakfast in bed, or flowers, or gifts, or taking it easy. If you are a mom, you can’t really get a day off. It’s a 24/7 life-long assignment. My mother raised three hellion daughters. (OK, maybe I earned that title more than the other two, but we were all three a hand-full, each in our own way.) I chased my older sister, Tracy, with shoes on my hands for goodness sake. And I meant to beat her with them. Hard. Mom hated mornings, yet she got up early every day to fry me an egg. She kept a beautiful house, always looked great, entertained friends, and kept things moving, quietly humming along. Mom had a system – wash whites on Monday, colors on Tuesday, dust on Wednesday, and vacuum on Thursday… She made it work. She always knew where the lost thing was – usually right in front of me. And when things got tough – I mean really tough: bankruptcy, lost home, lost friends, cancer (hers, then my sister Paige’s, then dad’s) – she never faltered. She kept to her routine, she kept on living, and she kept us all going. Quietly, reservedly, but she kept us all going. And she is still moving forward through life now, after the loss of Dad, in a way I never imagined and I am amazingly proud of. I always loved my mom, but I am not sure I always respected her. That is hard to admit, but it is true. Dad knew it and called me on it more than once. Boy, I sure do now. I long to be half the mom she was and is. When I drag my weary behind out of bed and put on the frying pan to make Jake an egg, I think of her and I smile sometimes. As I sat there in the car, whining about how I never get a real break, and the kids don’t respect me, and I just wanted a cup of hot coffee, I realized something. I realized that though I never really respected my mom enough, she was and is pretty awesome, so maybe I am doing something right. That is what it is all about. And when I can remember that, every day is Mother’s Day. P.S. 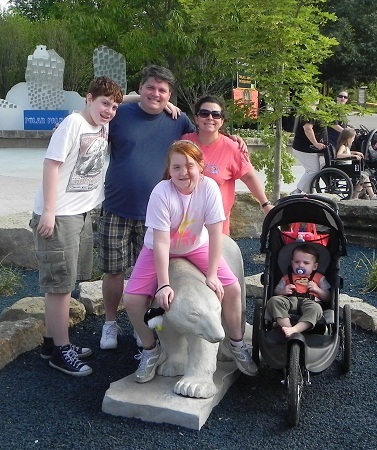 I went on to have a wonderful day at the zoo with my fabulous family.